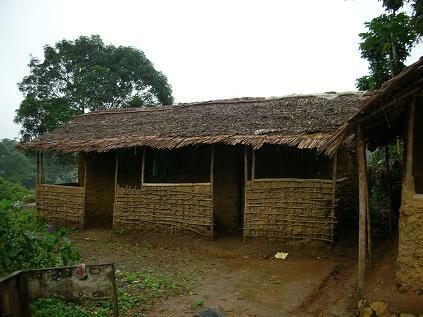 The mud hut is typical, this one in Guthrie Plantation. 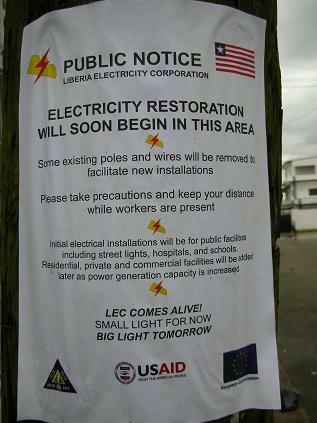 The electricity sign was in Mamba Point, where most of the NGO's and lots of UN agencies have their HQs. See nail head for size comparison. 1. Save up and buy a nice piece of lumber, like a sheet of plywood or a wide hardwood board. 2. Bring it to the outdoor market area where people sell building supplies. 3. Stand there with the other guys all day, yelling at passersby, selling pieces of your board. 4. When someone comes around to order a piece of it, run over to the guy with the handsaw and pay him to cut it for you. Human Development Reports have been around for a few years now, pioneered by the United Nations Development Program, and including data for the whole planet. Nowadays many countries are doing their own. Liberia’s just came out last Friday, and we’ve obtained a copy. For now, let’s just look at the page with all the statistics on it. Bad news is, the numbers are HORRIBLE! Good news is that most of the numbers are old, and there’s nowhere to go but up! Malaria: 26 thousand cases per 100 thousand people. More than one in four! (That would explain why Mendy and I both caught it within 3 months. ) It can’t do much for productivity to have 25% of your national workforce lying on the floor with a fever. Life expectancy for women is 47, men 48. Is that normal, that men would live longer than women on average? Mendy says no. I think it’s the opposite in the US. Fertility: 6.2 kids per woman! Imagine living to be 45 and having seven kids in that time. Makes you want to donate to Planned Parenthood. Secondary school enrolment: 40% for men and 26% for women. Female literacy: 26%. (2002) These last two numbers can be arrested relatively quickly by paying families to send their daughters to school, and the Administration is already rolling this out. Sounds insane, but they’ve done it with great success in Mexico and Brazil and other places. Otherwise many families will keep their girl kids home to work. And once a generation of kids gets through school and has kids of their own, the thought is that you won’t need to provide incentives anymore. Most of the other numbers are too old to write about. Ex: primary school enrolment is 34% in 2002, but it could be much better by now. There’s a census coming up next year, I think. More on the report in a later post, when we’ve had a chance to read it. Paid...Rain or Shine the Mail Must Go". And I'm glad it arrived, because I put a lot of work into that sucker! Seven pages or something. I paid LD$100 to mail it, which is like US$1.67, some 13 days ago. This was back before they had stamps. Now they have stamps. Their contract had expired last month, I think, but the Americans are suddenly back doing personal security for President Johnson-Sirleaf. One editorial I read this AM was complaining about it, but I can't imagine where else she has to turn, given the arson attack and the recent shooting matches between members of the state security forces. We met someone the other night who works in the building that's temporarily housing the Presidency since the fire, and this person says you have to be frisked and refrisked as you walk through the building, to the extent that it takes 20 minutes to get in to work. Seems that the various security forces working the building don't trust each other one bit. Apparently the President said something the other day about being angry at some newspapers for irresponsible reporting, and called for the creation of some kind of watchdog group to monitor their behavior. For better or for worse, the newspapers are treating her words as a grave threat, not least because they’re used to Taylor and his predecessors, who controlled the media with violence and intimidation. I would never advocate for any government doing anything to censor or control the media, outside of a well-crafted slander law. But some of the newspapers here are really painful to read, just pay-to-play hatchet jobs. Once again the papers are reporting on supernatural events without questioning their veracity AT ALL. This is a must read, for so many reasons. 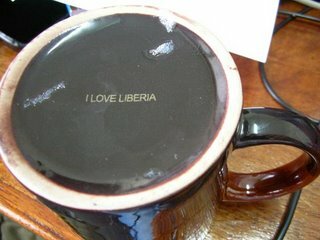 Liberian Times again. 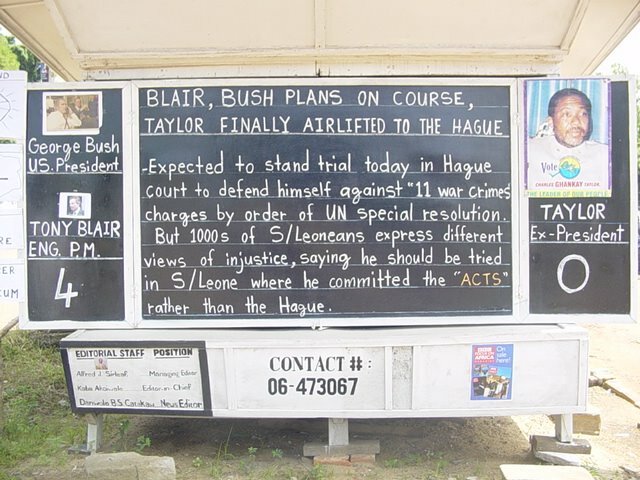 Last night we hung out with friends whose NGO rents the former house of Chuckie Taylor, son of Charles Taylor and allegedly one of the most evilest dudes ever in the history of the world. Chuckie is currently in detention in Florida charged with faking his immigration documents. The house is nice (9 bedrooms! ), marble floors, great view of the beach and a heck of a breeze on the veranda. If the place is haunted by the ghosts of Chuckie's victims, I don't know. But the other day somebody sleeping over in the house sleepwalked over the railing and off the balcony to the parking lot below. No serious injuries. 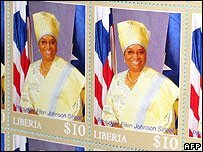 Liberia has issued its first postage stamps in more than ten years. Is it just me, or is it sorta weird to put your sitting president on a stamp? They said it couldn't be done. Thanks to Joy and to Dad for sending mail and proving that an overseas letter can be received in Liberia. I'm not sure how long it took because I wasn't able to get to the post office in the last few weeks. The only snag is that Joy's letter got all wet. The dude at the post office said, "Oh yeah, there's a window near some of the PO boxes, and when it rains, sometimes they get wet." Heavy sigh. 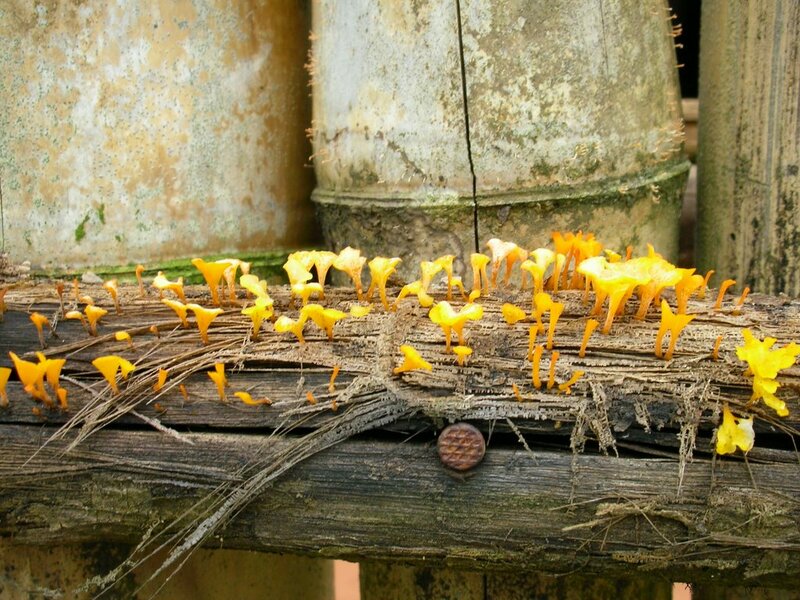 Following on a promise made a few weeks ago, the UN and the Government have finally taken the gigantic Guthrie Rubber Plantation away from the thousands of armed combatants that held it. 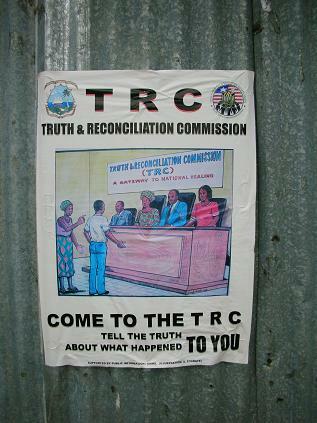 I think this was the last piece of rebel-occupied territory in Liberia. Mendy was just there the other day and says the conditions were the worst she's seen. Now comes the problem of what to do with thousands more unemployed ex-combatants. Hopefully most of them can stay and work. Rubber is important to the national economy, and so is the symbolism to this government of finally controlling all its own territory. 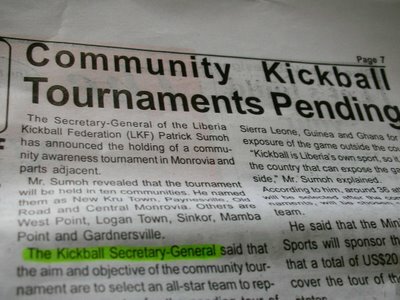 We are just learning about this, so excuse our ignorance, but it seems that kickball is a big deal in Liberia, with formal teams and everything. Even a national team! This article appeared in the paper on Thursday, and when I asked a carful of middle-class Liberians, they knew all about it, and had opinions. "Oh yeah, they're trying to increase its popularity as a sport, but they can't find a sponsor. The government should really make a contribution." Not sure if my ears were working properly, I asked if maybe they were talking about a different sport with the same name as the US version. But no. "It's just like baseball, with a big rubber ball." In the rainy season, the roads in many parts of the country are really ugly. 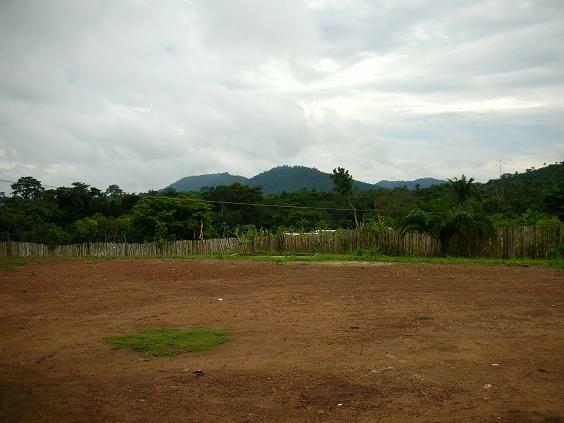 Our driver Zuana called this spot in Lofa County “Miracle Hill”. You can see people at the top of the hill waiting to see if we're going to make it. Somehow we made the 6 hour journey both ways without a winch. Just got back from Zorzor, Lofa County, way up north. Quite a breath of fresh air next to the chaos and grit of Monrovia. Which is an odd thing to say considering the abysmal shape that Zorzor town is in. 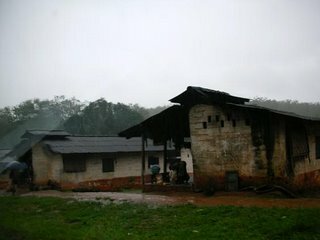 Nearly every concrete structure is demolished and full of bullet holes, and the majority mud huts aren’t doing much better. [Didnt' take enough pictures, sorry.] 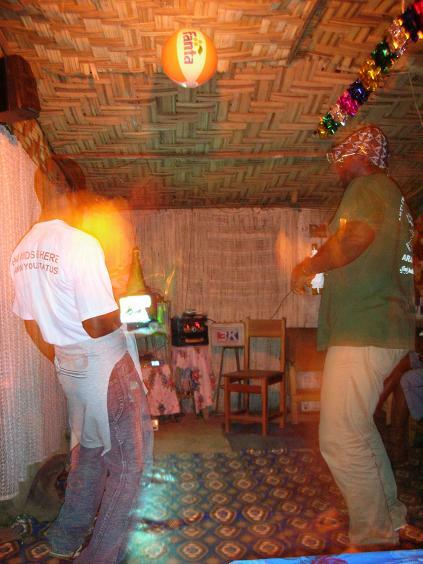 This was one of the prime entry spots for combatants from both Sierra Leone and Guinea, and the place took many poundings over the war years. Young people are in abundance in Zorzor town, standing around on the street, working to repair potholes on the roads for tips, hanging out around businesses, needing jobs. We went out one night to an “entertainment center” [see pic] on the town’s main road, and suddenly you could hear the banging of drums and crazy chanting of a gaggle of teenagers running by, acting wild. A young Liberian friend who’s not from the area said, “The youths here are very arrogant. They are mostly ex-combatants. They are out of control.” They haven'd had many options; today’s graduation ceremony at Zorzor Central High School is the first one in 15 years. Pakistani blue-helmets keep the peace in this area, and the radio station (Radio Life Zorzor-Salayea) airs nothing but peace messages and positive vibes all the time. 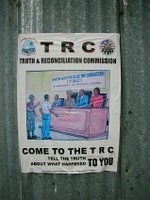 Tribalism has been a big social problem here, so they broadcast in several languages. an armed robbery attack, an assassination attempt or a false alarm being raised by the Deputy SSS boss to apparently exonerate himself from the recent attack at the home of his boss, Col. Massaquoi. One of Massaquoi's bodyguards was killed the other day, and this Pearl guy was let go after questioning. Editorials are raging at his release, likening it to the old days when the cops roamed and killed with impunity. A few papers are going with the story of the love triangle between the two SSS officials, but who knows. Ellen is over a barrel because I'm sure she'd like to create a personal bodyguard force, her own cops that she could trust, but this country (like many other West African states) has a bad history with such special forces. The papers constantly warn against the idea, and I'm sure she'd like to leave office without having re-institutionalized the practice. These guys are everywhere, as previously reported. They cut a hole in the bottom of a wheelbarrow and install a charcoal grill. The other day I saw one made out of a two-drawer filing cabinet! H.E. Ellen Johnson Sirleaf, President of the Republic of Liberia and the first woman ever to be elected as president of an African nation, has been named as the laureate of the 2006 Africa Prize for Leadership for the Sustainable End of Hunger. Thanks Allen for the link. 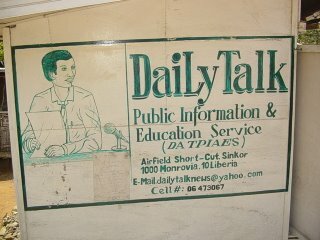 This guy, a Dutch economist, has a great site on Liberia with lots of history, politics, and economy links. Hey thanks for all the hits! We had a new record number on Monday. Anyone got a little bit of server space to donate so I can post a short mp3 for a couple of months? Get in touch. 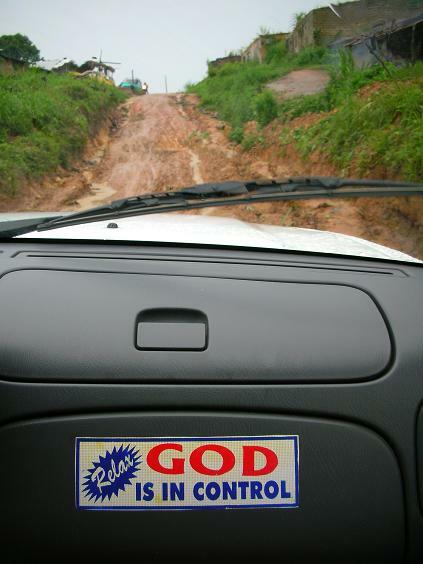 We're going on a field trip this weekend to Lofa, the northernmost county in Liberia, an area that borders Sierra Leone and Guinea. [See map.] Be back on Monday. First there was that fire on Independence Day that everyone thinks was arson, then the other day, the new head of State security (SSS) had two assassination attempts on him in two days, apparently by rival members of the SSS. And the second time, they killed his bodyguard. If the two events have nothing to do with each other, I'd be astounded. But it's really hard to tell what's going on! Now somebody tells me that her NGO got an email from the UN security people that the cabinet minister who had resigned for letting the blaze happen on his watch has been arrested. I can't find a newspaper to confirm that story, but it's early yet. UN Mission in Liberia chief yesterday assured the public that UNMIL's 15,000 troops will take care of anyone who tries to destablize the country. The Boston Globe on Chuckie Taylor, who's writing rap lyrics from jail in the US. He sounds a lot like the fictionalized version of him in Lord of War. On a more positive note, here's a wealthy Liberian who just moved back from the US and is investing heavily in housing. Need more guys like this! The reporter on this story doesn't seem to know much about the scope of the problem, so maybe I shouldn't pass judgement. But when unemployment is so high, it seems a little cruel (and potentially dangerous to the public) to be evicting street peddlers and confiscating their wares without the government first offering some sort of alternative arrangement: designated selling areas, skills training, even make-work programs. My cynical side makes me think that this is just a moneymaking scheme for an underfunded police force, because it sure doesn't seem like sound public policy. I can't imagine that the order is coming from very high up. Or maybe the government is over a barrel and is trying to send a message, to slow the rate of flight from the countryside into Monrovia. 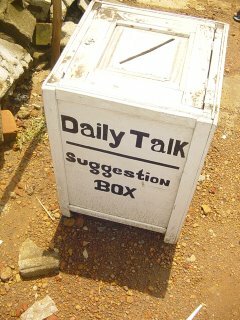 Social scientists have collected plenty of testimony from rural young people who say they'd much rather be pushing a wheelbarrow full of plastic sandals in the Capital than living a life of coerced field labor for Secret Society bosses in the bush. 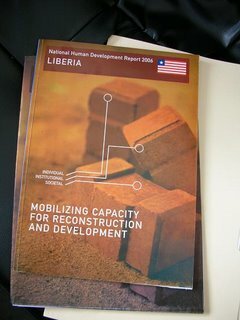 Liberia's rate of urbanization is slightly higher than its neighbors', partly because the civil war was mostly a rural phenomenon, so it made sense to leave the counties. The real tragedy of urbanization is that Liberia is greatly in need of rural agricultural development, in the name of food security. Land reform is one big part of the answer, reapportionment and the utilization of unoccupied spaces. The government does have plenty of land to parcel out, or even sell, if the will exists. All in time, I guess. Blackboard Journalism / Ledger Scooped! 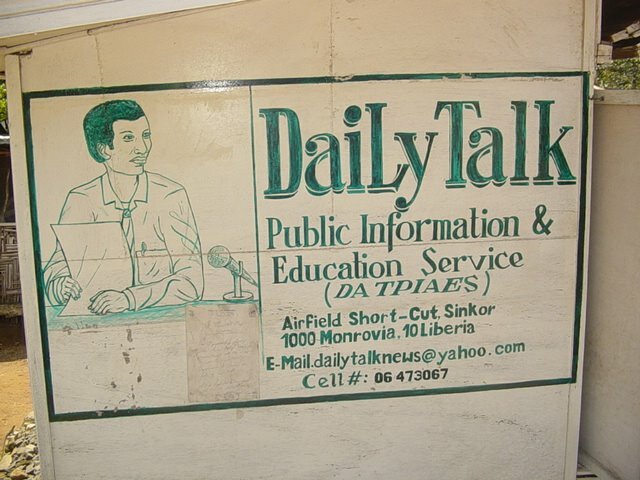 Thanks Nicolas for the link to this charming NYT story about a guy who uses a big blackboard to report the news out on Tubman Blvd, the East side of Monrovia's main road. The reporter must have been here for Founder's Day. Your Humble Editor is a little bitter because we emailed the blackboard journalist for an interview about 6 weeks ago and got no reply. Had planned to follow up by phone, but snoozed and lost. At least we can show off our pics! Here's a good overview of the current climate in Monrovia from the International Herald Tribune, using the electricity story as a peg. [Warning, nonsensical sideways scrolling required.] It's kind of annoying parachute journalism, but I guess your editor is not one to talk (yet). Reminds me of a conversation I overheard in a taxi yesterday between the cynical driver, who thinks the high price of gas just proves that the government is a failure, and a high school kid who was ticking off Sirleaf-Johnson's accomplishments and telling the driver to be patient. After decades of inordinately corrupt and unresponsive rulers, it boggles the mind that people would suddenly expect the government to solve all the country's horrendous economic and social problems overnight. But you do hear a lot of irrational impatience on the street. Thanks Dad for the link. Hardest Working Village in Show Business? 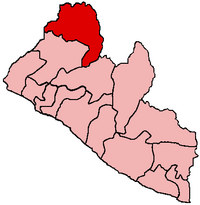 Do any of our Liberian readers know anything about a small village somewhere called James Brown? I heard a rumor that it exists, but not suprisingly, there's nothing on the web. The mapmakers at the Humanitarian Information Coordination dept of the UN told me that there are 10,000 settlements here, or rather, there's that many that have recognized names and place codes on the map. Lots of last names that end in H, like Teamah, Mulbah, Tarpeh, Tuah, Juah. Must be from one ethnic group? Biblical names like Ebenezer, Jonah, Moses. Someone told me which ethnic group goes for bible names, but I don’t remember. As in many places, Liberian people often have two first names, one formal and one informal. And here they say “C.K.A.” instead of “A.K.A.” Is that “Commonly known as”? I feel inadequate. I should change my name to something like Augustus Mulbah. Or Champion Tarbell. Or Amos Shavings. “[It] appears like the arson was a combination of inflammable pyrotechnics devices compounded with incendiary high velocity gasoline”. Upside is that the fire hasn't caused any wider problems, social or political. People were fearing the worst. *Incidentally, the guy who's been appointed interim is named Willis D. Knuckles, Jr. Even by Liberian standards, that is one hot name! Feature on Liberian names coming soon.